It’s very important to study and practice all the different Task 1 types so you can be fully prepared for your exam, including an IELTS Writing Task 1 Process. A lot of IELTS students (and teachers & books) focus too much on charts and tables, and not enough on other types such as maps and processes. Recently, process diagrams have been appearing more and more in the IELTS Writing exam. In this post we look at how to analyse a process carefully including the kind of process, how many steps and main stages, and knowing what is happening at each step. 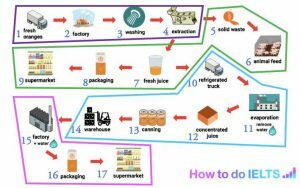 The process diagram below is based on a real IELTS exam from Jan 2018, and shows how orange juice is made. Click here for a sample answer for this question with line by line analysis. It’s a man-made process, which means it is carried out by people, compared to a natural process (e.g. the salmon life cycle below). It’s a linear process. This means it starts and finishes in different places. It doesn’t repeat itself. In a cyclical process (salmon life cycle below), at the end of the process it goes back to the beginning – it repeats. After confirming the kind of process, you should identify (find) how many steps there are, and categorise them logically into main stages. The first task is easy – just follow the process logically (following the arrows) and number them as you go (see my example below). From this it’s clear to see that there are a total of 17 steps. Remember to number the steps logically so that it follows the process (following the arrows), which helps you to see the process and its main stages. Compare my numbering above with the one below. The 2nd example also shows 17 steps but I numbered them left to right, which is not as helpful for analysing the diagram. Similar to other Task 1 question types, if you want a band 7 or above for Task Achievement you need a clear overview that summarises the whole diagram. For a process diagram, this means the examiner wants you to divide the process into main stages. This is tricky (difficult) as there is often more than one possible way. Choose whichever way you think is logical, and draw lines on the diagram to help you analyse and remember the stages. Purple: (Extraction) – producing & delivering fresh juice to supermarkets (and its by-product to farms). Blue: (Evaporation) – creating concentrated juice for storage. Pink: (Rehydration) – producing reconstituted orange juice for supermarkets. Using my notes write some sentences to describe this process.